Another ANZAC Day has come and gone. As with previous years I donned a suit with my medals affixed and attended a Dawn Service. This year, however, something seemed different. From the moment I stepped foot onto the rain-sodden grass of Warrawee Park and walked towards the Oakleigh Cenotaph I felt like an interloper at an event that I should have felt at ease attending. As far as I could tell under the glare of the nearby street lights, I was the only Modern-Day Veteran in attendance. Due to my previous volunteer work for Soldier On, I am no stranger to standing in front of a camera and playing the part of the modern-day Veteran for a cause or fundraising event. In the few short years since my participation with Australia’s highest profile ESO and subsequent withdrawal from Veteran Support Organisations and media engagements, I have seen an increase in the number of modern-day Veterans step in front of the camera and share their experiences with the community. A Veteran’s experiences on deployment are very personal and something that isn’t easily shared with others; especially strangers. When speaking to the media I would have a pre-prepared script in my head that I would follow. Even the details that I would share that seemed extremely personal were details that I had censored or had omitted entire events from to protect friends, family and myself. In an age where so many rely on social media and smart devices for their news and real time information it should be no surprise that many Politicians, businesses and ESO’s have embraced a more arguably aggressive media campaign leading up to and on ANZAC Day. From my vantage point at the back of the crowd during the Oakleigh Dawn Service it was easy to spot the dozen or so camera flashes each time a local Politician or business owner laid a wreath at the base of the Cenotaph. A brief check of two of the attending member’s social media accounts the day after the Service indicated that the photos taken during were posted online less than an hour after the actual wreath laying. Such instances are not rare, in fact, during the Dawn Service itself I could see multiple groups of younger persons taking selfies with either the congregation or Cenotaph in the background. The same was clearly evident during the day when television news programs reported on the various Capital City Dawn Services; it was a sea of smart phones glowing brightly, replacing what used to be candles providing a sombre atmosphere. A concerning emergence this ANZAC Day was the promotion of the ‘Struggling Modern-Day Veteran’ identity by various media outlets and some ESO’s. It’s a very fine line to tread at the best of times, but on the one day of the year when patriotism, jingoism and emotions can become blurred, some media reporting and ESO social media posts/promotions were seen by some people as being in bad taste. On one side of the coin is an article published by the ABC and written by Jane Cowan regarding Australian Veteran Chris May’s experiences during and after his deployments to Afghanistan. As co-founder of ESO Young Veterans, Chris is at the forefront of Veteran advocacy and often speaks of his personal experiences as way to engage, educate and de-stigmatise the issues many Veterans face regarding mental health and suicide. As someone who has done this previously and quite openly, I applaud his stance and candour on these issues and without a doubt the decision by both Chris and the ABC to publish this article on ANZAC Day was one that was not made without careful consideration. In this instance it was an article that was published with an aim to inform and educate; and not push an agenda or promotional angle. On the other side of the coin was a text message I and many thousands of others received in the afternoon on ANZAC Day from ESO Soldier On. Without being too critical of an organisation I once supported and represented, the timing and wording of the text message leaves a lot to be desired. I openly question the aggressive tone of the message, especially considering the audience receiving it would be primarily made up of Veterans and Veteran’s families. Have we not served and sacrificed for our country? 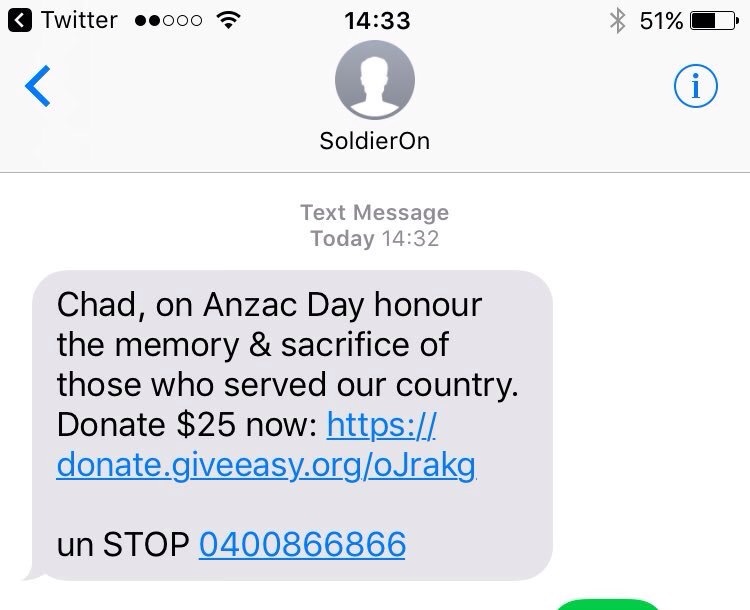 Do I really need to honour the memory of my dead friends, men killed in action on foreign soil, by sending $25 to Soldier On now? The Veteran ESO network is particularly vast in Australia with some organisations focusing on providing support and support programs tailored to a specific activity or operating within a small geographical area. Other, larger ESO’s, aim to engage with and provide support to a larger community of Veterans across many states and sometimes nationally by providing a multitude of support programs, activities and fundraising opportunities. It is via these fundraising opportunities that many ESO’s engage with the broader community and raise the necessary funds to continue to provide support services to Veterans and their families. It is often through this engagement via a fundraising platform that the wider community, without any direct connections to a wounded or service-affected Veteran, learns of the issues facing those of us that reach out to an ESO for assistance. Our experiences enter the public domain, with the aim of helping others; we share details that are often very personal and sometimes tragic. As I have written about before, some ESO’s are competing over finite sources of funding while simultaneously exploiting the experiences of Veterans and maintaining their focus on a what is a predominately negative narrative. Of course there will always be articles and social media posts written about the negative experiences of Veterans. Whilst we await the provision of adequate Government provided support services and wade through the quagmire that is interacting with the Australian Defence Force and the Department of Veterans Affairs; Veterans will continue to express their frustration and anger to a wider audience. We will continue to reach out to ESO’s for support and they will continue to reach out to the Australian public to open their ears, hearts and wallets to fill the gaping hole left by failure of the Government and DVA to provide timely, tailored and adequate support for Australia’s Veterans. But must they do this by continually presenting the Modern-Day Veteran as a victim? Those of us that live with physical and mental injuries deserve the best chance at a positive recovery. Each day is treated as a new step on a long journey to better our lives and the lives of those people we call friends and family. Our relatively new identity as an Australian Veteran is not and should not be treated as a burden. We are told to focus on the positives in our lives as we continue with our recovery. Should not those organisations purporting to assist us do the same? Previous Post What Does ANZAC Day Mean To You?